[S1] Ruth Bennett, Naudain Family of Delaware (Geneva, Neb. : n.pub., 1941), p. 82. This material is a typescript of "notes" in Ms. Bennett's possession and apparently was originally written and compiled by James W. Lattomus. Copies are with the D.A.R. Library, Washington, D.C., and Roger Bartlett, Austin, Tex., and can be viewed at http://www.rabgenealogy.com/ui53.htm. The notes contain some inconsistencies, and page 45 was missing from the D.A.R. Library copy when it was copied. [S1] Ruth Bennett, Naudain Family of Delaware, above, p. 101 (naming Joseph Bennett as her father). [S1] Ruth Bennett, Naudain Family of Delaware, above, p. 101 (naming Martha Jane Naudain as her mother). [S1] Ruth Bennett, Naudain Family of Delaware (Geneva, Neb. : n.pub., 1941), pp. 82-83. This material is a typescript of "notes" in Ms. Bennett's possession and apparently was originally written and compiled by James W. Lattomus. Copies are with the D.A.R. Library, Washington, D.C., and Roger Bartlett, Austin, Tex., and can be viewed at http://www.rabgenealogy.com/ui53.htm. The notes contain some inconsistencies, and page 45 was missing from the D.A.R. Library copy when it was copied. [S1] Ruth Bennett, Naudain Family of Delaware, above, p. 101 (naming Joseph Bennett as his father). [S1] Ruth Bennett, Naudain Family of Delaware, above, p. 101 (naming Martha Jane Naudain as his mother). [S1] Ruth Bennett, Naudain Family of Delaware, above, p. 101 (naming William Campbell Bennett as his father). [S1] Ruth Bennett, Naudain Family of Delaware, above, p. 101 (naming William Campbell Bennett as her father). [S1] Ruth Bennett, Naudain Family of Delaware, above, pp. 101-102 (naming William Campbell Bennett as his father). [S1] Ruth Bennett, Naudain Family of Delaware, above, p. 101 (naming Katherine Murphy as his mother). [S1] Ruth Bennett, Naudain Family of Delaware, above, p. 101 (naming Katherine Murphy as her mother). [S1] Ruth Bennett, Naudain Family of Delaware, above, pp. 101-102 (naming Joseph Bennett as his father). [S1] Ruth Bennett, Naudain Family of Delaware, above, pp. 101-102 (naming Martha Jane Naudain as his mother). [S1] Ruth Bennett, Naudain Family of Delaware, above, p. 82. [S1] Ruth Bennett, Naudain Family of Delaware, above, p. 102 (naming Corbit Naudain Bennett as her father). [S1] Ruth Bennett, Naudain Family of Delaware, above, p. 102 (naming Corbit Naudain Bennett as his father). Birth*: She was born on 3 March 1868. [S1] Ruth Bennett, Naudain Family of Delaware, above, pp. 101-102 (naming Joseph Bennett as her father). [S1] Ruth Bennett, Naudain Family of Delaware, above, pp. 101-102 (naming Martha Jane Naudain as her mother). Marriage*: He married Annie E. Dove on 26 September 1893. [S1] Ruth Bennett, Naudain Family of Delaware, above, pp. 101, 103 (naming Joseph Bennett as his father). [S1] Ruth Bennett, Naudain Family of Delaware, above, pp. 101, 103 (naming Martha Jane Naudain as his mother). [S1141] Hasley Cemetery, West Monroe, La., online http://ftp.rootsweb.com/pub/usgenweb/la/ouachita/cemeteries/…, (giving the year but not the place). [S1140] Ron Manley, electronic mail to Roger Bartlett, 14 Apr 2007, (citing Louisiana Statewide Death Index, 1900-1949). [S1] Ruth Bennett, Naudain Family of Delaware, above, p. 103 (naming Francis Clayton Bennett as her father). Marriage*: She married Francis Clayton Bennett, son of Joseph Bennett and Martha Jane Naudain, on 26 September 1893. [S1140] Ron Manley, electronic mail to Roger Bartlett, 14 Apr 2007. [S1141] Hasley Cemetery, West Monroe, La., online http://ftp.rootsweb.com/pub/usgenweb/la/ouachita/cemeteries/…, (giving her name as Ann A. Bennett). [S1141] Hasley Cemetery, West Monroe, La., online, above, (giving her name as Ann A. Bennett and giving the year but not the place). [S1] Ruth Bennett, Naudain Family of Delaware, above, p. 103 (stating that she is buried in Monroe, Louisiana). [S1] Ruth Bennett, Naudain Family of Delaware, above, pp. 101, 103 (naming Joseph Bennett as her father). [S1] Ruth Bennett, Naudain Family of Delaware, above, pp. 101, 103 (naming Martha Jane Naudain as her mother). [S1] Ruth Bennett, Naudain Family of Delaware, above, p. 103 (misstating the year as 1898). [S1] Ruth Bennett, Naudain Family of Delaware, above, pp. 82 (giving the date), 103 (omitting the date and identifying him as E. B. Twitchell). [S1] Ruth Bennett, Naudain Family of Delaware, above, p. 103 (naming James C. Smith as his father). [S1] Ruth Bennett, Naudain Family of Delaware (Geneva, Neb. : n.pub., 1941), pp. 82 (giving the date), 103 (omitting the date and identifying him as E. B. Twitchell). This material is a typescript of "notes" in Ms. Bennett's possession and apparently was originally written and compiled by James W. Lattomus. Copies are with the D.A.R. Library, Washington, D.C., and Roger Bartlett, Austin, Tex., and can be viewed at http://www.rabgenealogy.com/ui53.htm. The notes contain some inconsistencies, and page 45 was missing from the D.A.R. Library copy when it was copied. Note*: She lived in Mt. Carroll, Illinois. [S1] Ruth Bennett, Naudain Family of Delaware, above, p. 103 (giving his name as R. M. Ackerman). [S1] Ruth Bennett, Naudain Family of Delaware, above, p. 103 (naming R. M. Ackerman as his father). Other Names*: Anna Greggerson Naudain, Anna Naudain, Annie Greggerson Naudain, Annie Naudain. [S961] Find A Grave, online at http://www.findagrave.com, memorial for Annie S. Greggerson Naudain, memorial no. 99555625, viewed on 30 Jan 2014. [S961] Find A Grave, online, above, memorial for Thomas N. Naudain, memorial no. 99555666, viewed on 30 Jan 2014 (not giving the date). [S961] Find A Grave, online, above, memorial for Annie S. Greggerson Naudain, memorial no. 99555625, viewed on 30 Jan 2014 (not giving the date). [S1] Ruth Bennett, Naudain Family of Delaware (Geneva, Neb. : n.pub., 1941), p. 83. This material is a typescript of "notes" in Ms. Bennett's possession and apparently was originally written and compiled by James W. Lattomus. Copies are with the D.A.R. Library, Washington, D.C., and Roger Bartlett, Austin, Tex., and can be viewed at http://www.rabgenealogy.com/ui53.htm. The notes contain some inconsistencies, and page 45 was missing from the D.A.R. Library copy when it was copied. [S961] Find A Grave, online, above, memorial for Evelyn Naudain, memorial no. 79316712, viewed on 30 Jan 2014 (naming Annie S. Greggerson Naudain as her mother). [S961] Find A Grave, online, above, memorial for Annie S. Greggerson Naudain, memorial no. 99555625, viewed on 30 Jan 2014 (naming Annie S. Greggerson as her mother). [S1] Ruth Bennett, Naudain Family of Delaware, above, p. 83 (naming Anne S. Greggerson as her mother). Family 2: Charles L. Cole Jr.
[S1] Ruth Bennett, Naudain Family of Delaware (Geneva, Neb. : n.pub., 1941), pp. 83, 97 (naming Thomas N. Naudain as her father). This material is a typescript of "notes" in Ms. Bennett's possession and apparently was originally written and compiled by James W. Lattomus. Copies are with the D.A.R. Library, Washington, D.C., and Roger Bartlett, Austin, Tex., and can be viewed at http://www.rabgenealogy.com/ui53.htm. The notes contain some inconsistencies, and page 45 was missing from the D.A.R. Library copy when it was copied. [S1] Ruth Bennett, Naudain Family of Delaware, above, p. 83 (naming Sallie H. Perkins as her mother). [S1] Ruth Bennett, Naudain Family of Delaware, above, pp. 83, (giving the date but not the place), 97 (giving the date but not the place), 98 (naming the place but not giving the date). [S1] Ruth Bennett, Naudain Family of Delaware, above, pp. 83, 97 (giving the date but not the place). [S1510] Iowa, County Marriages, 1838-1934, online at https://www.familysearch.org, viewed on 3 Sep 2018, record for Alice Nandain [sic] and T. Andrew Bell. [S1511] Minnesota Marriages, 1849-1950, online at https://www.familysearch.org, viewed on 3 Sep 2018, record for Alice N. Bell and Charles L. Cole, Jr.
[S1] Ruth Bennett, Naudain Family of Delaware, above, pp. 83 (giving the date but not the place), 97 (giving the date but not the place), 98 (naming the place but not giving the date). [S1512] Minnesota, Birth and Death Records, 1866-1916, online at https://www.familysearch.org, viewed on 3 Sep 2018 (record for Alice Naudain Cole). [S1509] The St. Paul Globe, Saint Paul, Minn., online at http://www.newspapers.com, 30 Mar 1904, p. 8, col. 1 (under "Died"). [S1509] The St. Paul Globe, Saint Paul, Minn., online, above, 31 Mar 1904, p. 8, col. 1 (under "Vital Statistics, Deaths"). [S1] Ruth Bennett, Naudain Family of Delaware, above, p. 98. [S1] Ruth Bennett, Naudain Family of Delaware, above, pp. 84, 97-98 (naming Alice Naudain as his mother). [S1] Ruth Bennett, Naudain Family of Delaware (Geneva, Neb. : n.pub., 1941), pp. 83, 97 (giving the date but not the place). This material is a typescript of "notes" in Ms. Bennett's possession and apparently was originally written and compiled by James W. Lattomus. Copies are with the D.A.R. Library, Washington, D.C., and Roger Bartlett, Austin, Tex., and can be viewed at http://www.rabgenealogy.com/ui53.htm. The notes contain some inconsistencies, and page 45 was missing from the D.A.R. Library copy when it was copied. [S1] Ruth Bennett, Naudain Family of Delaware, above, pp. 97-98 (naming Thomas Andrew Bell as his father). Birth*: He was born on 10 January 1872. Death*: He died on 21 August 1872. [S1] Ruth Bennett, Naudain Family of Delaware (Geneva, Neb. : n.pub., 1941), pp. 83-84. This material is a typescript of "notes" in Ms. Bennett's possession and apparently was originally written and compiled by James W. Lattomus. Copies are with the D.A.R. Library, Washington, D.C., and Roger Bartlett, Austin, Tex., and can be viewed at http://www.rabgenealogy.com/ui53.htm. The notes contain some inconsistencies, and page 45 was missing from the D.A.R. Library copy when it was copied. [S1] Ruth Bennett, Naudain Family of Delaware, above, p. 97 (naming Thomas N. Naudain as his father). [S1] Ruth Bennett, Naudain Family of Delaware, above, p. 98 (stating that he was born in 1873 in Washington, D.C.). [S1402] Missouri Standard, Montgomery City, Mo., online at http://www.familysearch.org, 8 Feb 1901, abstract of obituary of Mrs. Alma Show Naudain, as appearing in Alma J. Enloe Wheeler, comp., Montgomery County, Missouri, Newspaper Records: Births, Marriages, Deaths, Misc., 1900-1901, Book 3, pp. 20, 73 (giving 19 Apr 1900 as their marriage date). [S1] Ruth Bennett, Naudain Family of Delaware, above, pp. 83 (spelling her name as Hagen), 98 (spelling her name as Hogen). [S1395] The Sioux City Journal, Sioux City, Iowa, online at http://www.newspapers.com, 8 Aug 1967, sec. A, p. 2, col. 4 (obituary of Mrs. Thomas Naudain). Other Names*: Alma Shaw, Alma Jane Shaw Naudain, Alma Shaw Naudain, Alma Jane Naudain, Alma Naudain, Alma Show, Alma Jane Show Naudain, Alma Show Naudain. [S1402] Missouri Standard, Montgomery City, Mo., online at http://www.familysearch.org, 8 Feb 1901, abstract of obituary of Mrs. Alma Show Naudain, as appearing in Alma J. Enloe Wheeler, comp., Montgomery County, Missouri, Newspaper Records: Births, Marriages, Deaths, Misc., 1900-1901, Book 3, p. 73. [S1402] Missouri Standard, Montgomery City, Mo., above, 8 Feb 1901, abstract of obituary of Mrs. Alma Show Naudain, as appearing in Alma J. Enloe Wheeler, comp., Montgomery County, Missouri, Newspaper Records: Births, Marriages, Deaths, Misc., 1900-1901, Book 3, pp. 20, 73 (giving 19 Apr 1900 as their marriage date). [S1402] Missouri Standard, Montgomery City, Mo., above, 8 Feb 1901, abstract of obituary of Mrs. Alma Show Naudain, as appearing in Alma J. Enloe Wheeler, comp., Montgomery County, Missouri, Newspaper Records: Births, Marriages, Deaths, Misc., 1900-1901, Book 3, p. 73 (giving 19 Apr 1900 as their marriage date). Other Names*: Minnie Hagen Naudain, Minnie Naudain, Minnie Hogen Naudain. "Mrs. Thomas N. Naudain, 87, a resident of Ingleside Nursing Home, died early Tuesday at a Sioux City hospital following an extended illness. "Mrs. Naudain, the former Minnie Hagen, was born July 9, 1880, at Hospers, Iowa. She was married April 9, 1906, at Lincoln. He died Aug. 5, 1955, at Sioux City. Mrs. Naudain had been a resident of Sioux City 63 years, moving here from Omaha. She had lived with a niece, Mrs. C. H. Foster, 3130 Nebraska St., before moving to the nursing home. [S1] Ruth Bennett, Naudain Family of Delaware (Geneva, Neb. : n.pub., 1941), pp. 83 (spelling her name as Hagen), 98 (spelling her name as Hogen). This material is a typescript of "notes" in Ms. Bennett's possession and apparently was originally written and compiled by James W. Lattomus. Copies are with the D.A.R. Library, Washington, D.C., and Roger Bartlett, Austin, Tex., and can be viewed at http://www.rabgenealogy.com/ui53.htm. The notes contain some inconsistencies, and page 45 was missing from the D.A.R. Library copy when it was copied. [S1395] The Sioux City Journal, above, 8 Aug 1967, sec. A, p. 2, col. 4 (obituary of Mrs. Thomas Naudain) (stating that she died in a hospital early that morning following an "extended" illness). [S961] Find A Grave, online at http://www.findagrave.com, memorial for Minnie Naudain, memorial no. 8786784, viewed on 5 Oct 2017 (giving the month and year but no other information). [S1395] The Sioux City Journal, above, 9 Aug 1967, sec. B, p. 13, cols. 3-4 (obituary of Mrs. Thomas Naudain). [S961] Find A Grave, online, above, memorial for Minnie Naudain, memorial no. 8786784, viewed on 5 Oct 2017. [S1395] The Sioux City Journal, above, 8 Aug 1967, sec. A, p. 2, col. 4. 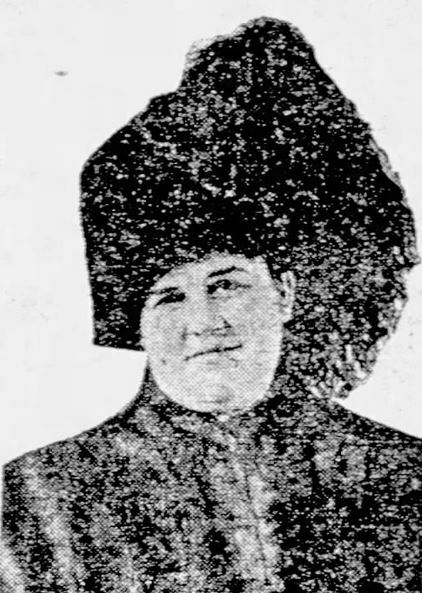 Estelle Naudain, Sioux City Journal, Sioux City, Iowa, 5 Feb 1911. [S1] Ruth Bennett, Naudain Family of Delaware, above, p. 97 (naming Thomas N. Naudain as her father). 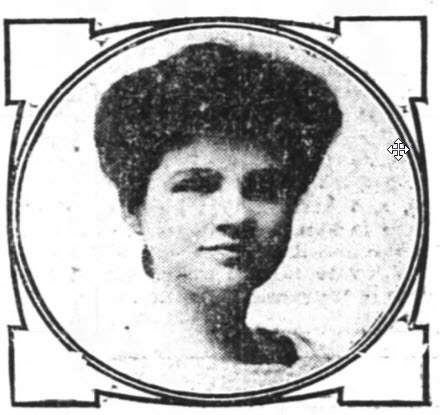 May Naudain, from the New York Times, 1906. Other Names*: Mary Arnold Naudain George, Mary Naudain George, Mary Arnold George, Mary George, May Naudain, May George. "Miss Nellie Webb has left the ‘Babes in Toyland’ show to go with Julia Marlowe and Manager Julian Mitchell without much hesitancy awarded the vacancy to the Omaha girl. In it she will have a better chance to develop her peculiar talents. "After leaving Omaha Miss Naudain studied for the voice for some time and while doing so was employed as stenographer by a prominent theatrical manager who was one of the men that brought out ‘Babes in Toyland.’ He assisted her in getting a small part and her own talent and hard work have done the rest." • "A wedding of much interest both in Omaha and New York City will be that of Miss May Naudain, daughter of Mrs. Mary Callaway Naudain of this city, to Mr. Charles Henry George of New York, which will take place Tuesday, June 15, at high noon, at the home of Mr. and Mrs. E. V. Lewis. The ceremony will be performed by Rev. T. J. Mackay and will be followed by a wedding breakfast. Miss Naudain and her mother arrived Monday from New York to be the guests of Mr. and Mrs. Lewis until after the wedding, and Mrs. Sherman Canfield will arrive the latter part of the week. The other members of the bridal party are expected the week of the wedding. Mr. Walter Reid Callender of Providence, R. I., will serve as best man and the ushers will be Mr. Robert H. Gay, Mr. W. F. Forepaugh, both of New York City; Mr. George Hixon of Chicago, Mr. Clark Rosecrantz of Milwaukee and Mr. Eagle of New York. Mrs. Sherman Canfield, who will be the matron of honor, will be the bride’s only attendant. Miss Naudain’s host of admirers, while wishing her happiness, regret that she is to give up her career on the stage, where she holds most enviable position. Few singers have had the success and popularity that Miss Naudain has attained in so short a time, and many flattering offers for next season have been refused. Several social affairs will be given in honor of Miss Naudain, although she is here resting after a strenuous season in New York." "New York, May 19 .—Miss May Naudain, a young actress who in a few years has attached marked success in musical comedy and light opera is engaged to C. H. George, of the New York banking house of Flower & Co. They will be married next month, and Miss Naudain will permanently retire from the stage; in fact, she has already done so. She had been cast for an important role in “The Dollar Princess,” which Charles Frohman is to produce soon, and the first intimation of her engagement and approaching marriage came when she asked to be allowed to withdraw from her contract. While sorry to lose her from his force, Mr. Frohman said he had nothing to do but say yes. "Miss Naudain’s advancement on the stage has been very rapid. She is the daughter of a banker and her home is in Omaha, Neb. She came to New York only five years ago. She had been educated for the grand opera stage and her voice, a soprano of great range and sweetness, at once attracted attention." • "MAY NAUDAIN WEDS BANKER. "Comic Opera Singer the Bride of C. H. George of New York. "Special to The New York Times. "OMAHA, Neb., June 15 .—Charles Henry George, a member of the firm of Flower & Co., New York bankers, was married here to-day to Miss May Naudain, the former comic opera singer. Miss Naudain is an Omaha girl, and the ceremony was performed at the home of her uncle, E. V. Lewis. "Walker Reid Callender of Providence, R. I., was best man, and the ushers were Robert H. Gay, W. F. Forepaugh, and Mr. Eagle of New York; George Nixon of Chicago, and Clark Rosencrantz of Milwaukee. "A wedding breakfast and reception followed the ceremony. Afterward Mr. and Mrs. George left for New York, where they will stay for a month at the Hotel Gotham, then making a tour of Europe. • Here Find A Grave memorial, which includes pictures of her tombstone, is here. [S961] Find A Grave, online at http://www.findagrave.com, memorial for Mary Naudain George, memorial no. 96221476, viewed on 2 Jul 2016 (giving the year but no other information). [S1169] The New York Times, New York, N.Y., 16 Jun 1909, p. 1, col. 2. [S961] Find A Grave, online, above, memorial for Mary Naudain George, memorial no. 96221476, viewed on 2 Jul 2016. [S1341] The Omaha Sunday Bee, Omaha, Neb., online at http://www.newspapers.com, 30 May 1909, p. 11, col. 6 (second bullet). [S1341] The Omaha Sunday Bee, Omaha, Neb., above, 6 Mar 1904, p. 10, cols. 6-7 first bullet). [S1274] El Paso Herald, El Paso, Tex., 19 May 1909, p. 5, col. 4 (third bullet). [S1169] The New York Times, New York, N.Y., 16 Jun 1909, p. 1, col. 2 (fourth bullet). Scrapbook*: • "A wedding of much interest both in Omaha and New York City will be that of Miss May Naudain, daughter of Mrs. Mary Callaway Naudain of this city, to Mr. Charles Henry George of New York, which will take place Tuesday, June 15, at high noon, at the home of Mr. and Mrs. E. V. Lewis. The ceremony will be performed by Rev. T. J. Mackay and will be followed by a wedding breakfast. Miss Naudain and her mother arrived Monday from New York to be the guests of Mr. and Mrs. Lewis until after the wedding, and Mrs. Sherman Canfield will arrive the latter part of the week. The other members of the bridal party are expected the week of the wedding. Mr. Walter Reid Callender of Providence, R. I., will serve as best man and the ushers will be Mr. Robert H. Gay, Mr. W. F. Forepaugh, both of New York City; Mr. George Hixon of Chicago, Mr. Clark Rosecrantz of Milwaukee and Mr. Eagle of New York. Mrs. Sherman Canfield, who will be the matron of honor, will be the bride’s only attendant. Miss Naudain’s host of admirers, while wishing her happiness, regret that she is to give up her career on the stage, where she holds most enviable position. Few singers have had the success and popularity that Miss Naudain has attained in so short a time, and many flattering offers for next season have been refused. Several social affairs will be given in honor of Miss Naudain, although she is here resting after a strenuous season in New York." [S961] Find A Grave, online at http://www.findagrave.com, memorial for Charles Henry George, memorial no. 96221522, viewed on 2 Jul 2016. [S1341] The Omaha Sunday Bee, Omaha, Neb., online at http://www.newspapers.com, 30 May 1909, p. 11, col. 6 (first bullet). [S1274] El Paso Herald, El Paso, Tex., 19 May 1909, p. 5, col. 4 (second bullet). [S1169] The New York Times, New York, N.Y., 16 Jun 1909, p. 1, col. 2 (third bullet). [S961] Find A Grave, online at http://www.findagrave.com, memorial for Evelyn Naudain, memorial no. 79316712, viewed on 30 Jan 2014 (naming Thomas N. Naudain as her father). [S961] Find A Grave, online, above, memorial for Thomas N. Naudain, memorial no. 99555666, viewed on 30 Jan 2014 (naming Thomas N. Naudain as her father). [S1] Ruth Bennett, Naudain Family of Delaware (Geneva, Neb. : n.pub., 1941), p. 83 (naming Thomas Nelson Naudain as her father). This material is a typescript of "notes" in Ms. Bennett's possession and apparently was originally written and compiled by James W. Lattomus. Copies are with the D.A.R. Library, Washington, D.C., and Roger Bartlett, Austin, Tex., and can be viewed at http://www.rabgenealogy.com/ui53.htm. The notes contain some inconsistencies, and page 45 was missing from the D.A.R. Library copy when it was copied. [S961] Find A Grave, online, above, memorial for Evelyn Naudain, memorial no. 79316712, viewed on 30 Jan 2014. [S1] Ruth Bennett, Naudain Family of Delaware, above, p. 83. [S1108] Social Security Death Index, online at http://tinyurl.com/RootswebSSDI, viewed 25 Aug 2007 (stating that she died in Sep 1994; not giving the place of death but stating that her last residence was in Laguna Hills, California). [S1418] Los Angeles Times, Los Angeles, Calif., online at http://www.newspapers.com, 5 Apr 1952, p. 13, cols. 3-4 ("Contest Winner Shares Luck with Sanitarium"). [S1] Ruth Bennett, Naudain Family of Delaware (Geneva, Neb. : n.pub., 1941), pp. 97-98 (naming Thomas Andrew Bell as his father). This material is a typescript of "notes" in Ms. Bennett's possession and apparently was originally written and compiled by James W. Lattomus. Copies are with the D.A.R. Library, Washington, D.C., and Roger Bartlett, Austin, Tex., and can be viewed at http://www.rabgenealogy.com/ui53.htm. The notes contain some inconsistencies, and page 45 was missing from the D.A.R. Library copy when it was copied. [S1] Ruth Bennett, Naudain Family of Delaware, above, p. 84. [S961] Find A Grave, online at http://www.findagrave.com, memorial for William A. Bell, memorial no. 51016362, viewed on 3 Sep 2018 (giving the year but no other information). [S1] Ruth Bennett, Naudain Family of Delaware, above, pp. 84, 98. [S961] Find A Grave, online, above, memorial for William A. Bell, memorial no. 51016362, viewed on 3 Sep 2018. [S312] Social Security Death Index, online at http://tinyurl.com/AncestrySSDI, viewed on 26 Feb 1998 (stating that he died in Jan 1970; not naming the place of death but stating that he lived in Tucson, Arizona when he died). Other Names*: Gulie Caperton, Gulie Corbett Caperton Bell, Gulie Caperton Bell, Gulie Corbett Bell, Gulie Bell, Julie Corbett, Julie Caperton, Julie Corbett Caperton Bell, Julie Caperton Bell, Julie Corbett Bell, Julie Bell. • Her Find A Grave memorial, which includes additional biographical information and a picture of her tombstone, is here. [S961] Find A Grave, online at http://www.findagrave.com, memorial for Gulie Corbett Caperton-Bell, memorial no. 51016359, viewed on 3 Sep 2018. [S1] Ruth Bennett, Naudain Family of Delaware (Geneva, Neb. : n.pub., 1941), pp. 84, 98. This material is a typescript of "notes" in Ms. Bennett's possession and apparently was originally written and compiled by James W. Lattomus. Copies are with the D.A.R. Library, Washington, D.C., and Roger Bartlett, Austin, Tex., and can be viewed at http://www.rabgenealogy.com/ui53.htm. The notes contain some inconsistencies, and page 45 was missing from the D.A.R. Library copy when it was copied. [S1] Ruth Bennett, Naudain Family of Delaware, above, pp. 84, 98 (spelling her name as Julie). [S961] Find A Grave, online, above, memorial for Gulie Corbett Caperton-Bell, memorial no. 51016359, viewed on 3 Sep 2018 (spelling her name as Gulie and including a photograph of her tombstone with that spelling). [S1] Ruth Bennett, Naudain Family of Delaware (Geneva, Neb. : n.pub., 1941), p. 87 (naming Harold Naudain as her father). This material is a typescript of "notes" in Ms. Bennett's possession and apparently was originally written and compiled by James W. Lattomus. Copies are with the D.A.R. Library, Washington, D.C., and Roger Bartlett, Austin, Tex., and can be viewed at http://www.rabgenealogy.com/ui53.htm. The notes contain some inconsistencies, and page 45 was missing from the D.A.R. Library copy when it was copied. Obituary*: "NAUDAIN—At Memphis, Tenn., June 30, George Standish Naudain, husband of Myra Reed Naudain, and son of Mr. and Mrs. Harold Naudain of St. Louis. [S1] Ruth Bennett, Naudain Family of Delaware (Geneva, Neb. : n.pub., 1941), pp. 87, 98 (naming Harold Naudain as his father). This material is a typescript of "notes" in Ms. Bennett's possession and apparently was originally written and compiled by James W. Lattomus. Copies are with the D.A.R. Library, Washington, D.C., and Roger Bartlett, Austin, Tex., and can be viewed at http://www.rabgenealogy.com/ui53.htm. The notes contain some inconsistencies, and page 45 was missing from the D.A.R. Library copy when it was copied. [S1349] Saint Louis Post-Dispatch, Saint Louis, Mo., online at http://www.newspapers.com, 2 Jul 1906, p. 14, col. 1 (obituary of George Standish Naudain) (naming Harold Naudain as his father). [S1] Ruth Bennett, Naudain Family of Delaware, above, pp. 87, 98. [S1349] Saint Louis Post-Dispatch, Saint Louis, Mo., above, 2 Jul 1906, p. 14, col. 1 (obituary of George Standish Naudain) (not giving the date). [S1] Ruth Bennett, Naudain Family of Delaware, above, pp. 87, 98 (giving the date but not the place). [S1349] Saint Louis Post-Dispatch, Saint Louis, Mo., above, 2 Jul 1906, p. 14, col. 1 (obituary of George Standish Naudain). [S1349] Saint Louis Post-Dispatch, Saint Louis, Mo., above, 2 Jul 1906, p. 14, col. 1. [S1] Ruth Bennett, Naudain Family of Delaware, above, p. 98 (naming George Standish Naudain as his father). Other Names*: Myra Reed, Myra Reed Naudain, Myra Naudain. [S961] Find A Grave, online at http://www.findagrave.com, memorial for viewed on 3 Apr 2010 (Myra Reed Naudain, memorial no. 36038302). [S1] Ruth Bennett, Naudain Family of Delaware (Geneva, Neb. : n.pub., 1941), pp. 87, 98. This material is a typescript of "notes" in Ms. Bennett's possession and apparently was originally written and compiled by James W. Lattomus. Copies are with the D.A.R. Library, Washington, D.C., and Roger Bartlett, Austin, Tex., and can be viewed at http://www.rabgenealogy.com/ui53.htm. The notes contain some inconsistencies, and page 45 was missing from the D.A.R. Library copy when it was copied. [S1349] Saint Louis Post-Dispatch, Saint Louis, Mo., online at http://www.newspapers.com, 2 Jul 1906, p. 14, col. 1 (obituary of George Standish Naudain) (not giving the date). [S1] Ruth Bennett, Naudain Family of Delaware, above, p. 98 (naming Myra R. Reed as his mother). [S1] Ruth Bennett, Naudain Family of Delaware, above, p. 99. [S1] Ruth Bennett, Naudain Family of Delaware, above, pp. 98-99 (naming Harold Woodward Naudain as her father). [S1] Ruth Bennett, Naudain Family of Delaware, above, pp. 98-99 (naming Harold Woodward Naudain as his father). [S1495] The Evening Citizen, Ottawa, Ont., online at http://www.newspapers.com, p. 5, col. 2 (marriage announcement of Doris May Nolan and Richard Standish Naudain) (naming Harold W. Naudain as his father). [S1] Ruth Bennett, Naudain Family of Delaware, above, pp. 98-99 (naming Daisy Iona Nead as her mother). [S1] Ruth Bennett, Naudain Family of Delaware, above, pp. 98-99 (naming Daisy Iona Mead as his mother). Obituary*: "NAUDAIN—Oct. 20, 1892, EUGENE NAUDAIN, son of Harold and Florence Naudain, aged 7 months. [S1] Ruth Bennett, Naudain Family of Delaware (Geneva, Neb. : n.pub., 1941), p. 87 (naming Harold Naudain as his father). This material is a typescript of "notes" in Ms. Bennett's possession and apparently was originally written and compiled by James W. Lattomus. Copies are with the D.A.R. Library, Washington, D.C., and Roger Bartlett, Austin, Tex., and can be viewed at http://www.rabgenealogy.com/ui53.htm. The notes contain some inconsistencies, and page 45 was missing from the D.A.R. Library copy when it was copied. [S1349] Saint Louis Post-Dispatch, Saint Louis, Mo., online at http://www.newspapers.com, 21 Oct 1892, p. 6, col. 5 (naming Harold Naudain as his father). [S1349] Saint Louis Post-Dispatch, Saint Louis, Mo., above, 21 Oct 1892, p. 6, col. 5 (naming Florence Naudain as his mother). [S1349] Saint Louis Post-Dispatch, Saint Louis, Mo., above, 21 Oct 1892, p. 6, col. 5 (not giving the date but stating that he was seven months old when he died). [S1349] Saint Louis Post-Dispatch, Saint Louis, Mo., above, 21 Oct 1892, p. 6, col. 5. 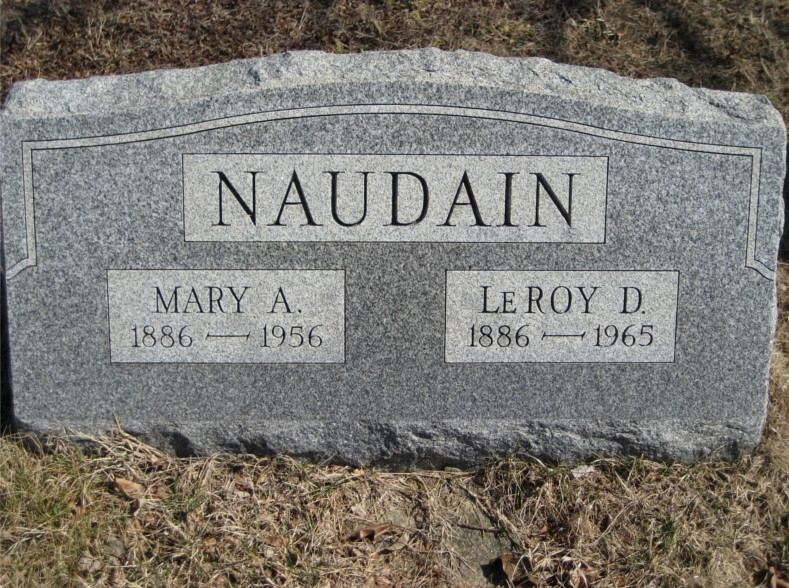 LeRoy Day Naudain's tombstone, Berlin Cemetery, Berlin, N.J., courtesy of "13th Generation of Fairbanks in America" on Find A Grave. [S1] Ruth Bennett, Naudain Family of Delaware (Geneva, Neb. : n.pub., 1941), pp. 87 (naming Jacob Vandegrift Naudain as his father), 99 (naming Jacob V. Naudain as his father). This material is a typescript of "notes" in Ms. Bennett's possession and apparently was originally written and compiled by James W. Lattomus. Copies are with the D.A.R. Library, Washington, D.C., and Roger Bartlett, Austin, Tex., and can be viewed at http://www.rabgenealogy.com/ui53.htm. The notes contain some inconsistencies, and page 45 was missing from the D.A.R. Library copy when it was copied. [S312] Social Security Death Index, online at http://tinyurl.com/AncestrySSDI, viewed on 27 Mar 1998 (giving only the date). [S1] Ruth Bennett, Naudain Family of Delaware, above, pp. 87 (giving the date but not the place), 99 (giving the date and place). [S961] Find A Grave, online at http://www.findagrave.com, memorial for LeRoy D. Naudain, memorial no. 126550759, viewed on 22 Jul 2018 (giving the year but no other information). [S1] Ruth Bennett, Naudain Family of Delaware, above, pp. 87, 99. [S1466] Courier-Post, Camden, N.J., online at http://www.newspapers.com, 4 Jun 1956, p. 4, col. 5 (obituary for Mrs. Mary A. Naudain) (not giving a date; naming LeRoy D. Naudain as her surviving husband). [S961] Find A Grave, online, above, memorial for Mary A. Naudain, memorial no. 126550711, viewed on 22 Jul 2018 (not giving the date). [S961] Find A Grave, online, above, memorial for LeRoy D. Naudain, memorial no. 126550759, viewed on 22 Jul 2018 (not giving the date). [S961] Find A Grave, online, above, memorial for LeRoy D. Naudain, memorial no. 126550759, viewed on 22 Jul 2018. [S1] Ruth Bennett, Naudain Family of Delaware, above, p. 99 (naming LeRoy Day Naudain as her father). [S1466] Courier-Post, Camden, N.J., online, above, 5 Oct 1936, p. 10, cols. 4-5 ("Miss Naudain . . . Among Early October Brides . . .") (naming LeRoy B. Naudain as her father). [S1] Ruth Bennett, Naudain Family of Delaware, above, p. 99 (naming LeRoy Day Naudain as his father). Mary Parker Naudain's tombstone, Berlin Cemetery, Berlin, N.J., courtesy of "13th Generation of Fairbanks in America" on Find A Grave. Other Names*: Mary Parker, Mary Agnes Parker Naudain, Mary Parker Naudain, Mary Agnes Naudain, Mary Naudain. Note*: • She was from Philadelphia. • She had lived in Riverton, N.J. for fourteen years at the time of her death. Before then she lived in Haddon Heights, N.J.
[S961] Find A Grave, online at http://www.findagrave.com, memorial for Mary A. Naudain, memorial no. 126550711, viewed on 22 Jul 2018. [S1] Ruth Bennett, Naudain Family of Delaware (Geneva, Neb. : n.pub., 1941), pp. 87, 99. This material is a typescript of "notes" in Ms. Bennett's possession and apparently was originally written and compiled by James W. Lattomus. Copies are with the D.A.R. Library, Washington, D.C., and Roger Bartlett, Austin, Tex., and can be viewed at http://www.rabgenealogy.com/ui53.htm. The notes contain some inconsistencies, and page 45 was missing from the D.A.R. Library copy when it was copied. [S1466] Courier-Post, Camden, N.J., online, above, 4 Jun 1956, p. 4, col. 5 (obituary for Mrs. Mary A. Naudain) (stating that she died "after a long illness"). [S961] Find A Grave, online, above, memorial for Mary A. Naudain, memorial no. 126550711, viewed on 22 Jul 2018 (giving the year but no other information). [S1] Ruth Bennett, Naudain Family of Delaware, above, pp. 87, 99 (first bullet). [S1466] Courier-Post, Camden, N.J., online, above, 4 Jun 1956, p. 4, col. 5 (obituary for Mrs. Mary A. Naudain) (second bullet). [S1466] Courier-Post, Camden, N.J., online, above, 4 Jun 1956, p. 4, col. 5 (obituary for Mrs. Mary A. Naudain) (third bullet). [S1] Ruth Bennett, Naudain Family of Delaware, above, p. 99 (naming Mary Agnes Parker as her mother). [S1] Ruth Bennett, Naudain Family of Delaware, above, p. 99 (naming Mary Agnes Parker as his mother). Marriage*: She married Andrew J. Day. [S1] Ruth Bennett, Naudain Family of Delaware (Geneva, Neb. : n.pub., 1941), p. 87 (naming Sarah _____ as her mother). This material is a typescript of "notes" in Ms. Bennett's possession and apparently was originally written and compiled by James W. Lattomus. Copies are with the D.A.R. Library, Washington, D.C., and Roger Bartlett, Austin, Tex., and can be viewed at http://www.rabgenealogy.com/ui53.htm. The notes contain some inconsistencies, and page 45 was missing from the D.A.R. Library copy when it was copied. Other Names*: Anne Elizabeth Naudain Camp, Anne Naudain Camp, Anne Elizabeth Camp, Anne Camp. [S1] Ruth Bennett, Naudain Family of Delaware (Geneva, Neb. : n.pub., 1941), pp. 87-88 (naming John Wesley Naudain as her father), 99 (naming John W. Naudain as her father). This material is a typescript of "notes" in Ms. Bennett's possession and apparently was originally written and compiled by James W. Lattomus. Copies are with the D.A.R. Library, Washington, D.C., and Roger Bartlett, Austin, Tex., and can be viewed at http://www.rabgenealogy.com/ui53.htm. The notes contain some inconsistencies, and page 45 was missing from the D.A.R. Library copy when it was copied. [S1] Ruth Bennett, Naudain Family of Delaware, above, pp. 87-88 (naming Rachel Sabra McCall as her mother). [S1] Ruth Bennett, Naudain Family of Delaware, above, pp. 88, 99. [S1] Ruth Bennett, Naudain Family of Delaware, above, p. 99 (naming Anna Elizabeth Naudain as her mother). Other Names*: Daniel Camp, D. I. Camp. [S1386] Chillicothe Gazette, Chillicothe, Ohio, online at http://www.newspapers.com, 20 Apr 1945, p. 2, col. 3 (obituary of Rev. D. I. Camp) (not giving the date but stating that he was eighty-four years old when he died on 19 Apr 1945). [S1] Ruth Bennett, Naudain Family of Delaware (Geneva, Neb. : n.pub., 1941), pp. 88, 99. This material is a typescript of "notes" in Ms. Bennett's possession and apparently was originally written and compiled by James W. Lattomus. Copies are with the D.A.R. Library, Washington, D.C., and Roger Bartlett, Austin, Tex., and can be viewed at http://www.rabgenealogy.com/ui53.htm. The notes contain some inconsistencies, and page 45 was missing from the D.A.R. Library copy when it was copied. [S1386] Chillicothe Gazette, Chillicothe, Ohio, above, 20 Apr 1945, p. 2, col. 3 (obituary of Rev. D. I. Camp). [S1] Ruth Bennett, Naudain Family of Delaware, above, p. 99 (naming Rev. Daniel Ivins Camp as her father). Other Names*: Mary Naudain, Ida Naudain. "Miss Ida Naudain Falls Dead While Conversing With Relatives. "Ida, daughter of Magistrate John N. [sic] Naudain, of Townsend, died suddenly at her father’s home yesterday. She was about 25 years old and a general favorite with a large circle of friends. "Last winter she was attacked by an affection [sic] of the throat. It had troubled her more or less ever since, but nothing serious was apprehended. At the time she was stricken by death she was sitting up conversing with members of the family. [S1] Ruth Bennett, Naudain Family of Delaware (Geneva, Neb. : n.pub., 1941), pp. 87-88 (naming John Wesley Naudain as her father). This material is a typescript of "notes" in Ms. Bennett's possession and apparently was originally written and compiled by James W. Lattomus. Copies are with the D.A.R. Library, Washington, D.C., and Roger Bartlett, Austin, Tex., and can be viewed at http://www.rabgenealogy.com/ui53.htm. The notes contain some inconsistencies, and page 45 was missing from the D.A.R. Library copy when it was copied. [S961] Find A Grave, online at http://www.findagrave.com, memorial for Mary Ida Naudain, memorial no. 129865960, viewed on 6 Aug 2016 (naming John W. Naudain as her father). [S961] Find A Grave, online, above, memorial for John W. Naudain, memorial no. 129866009, viewed on 6 Aug 2016 (naming John W. Naudain as her father). [S961] Find A Grave, online, above, memorial for Mary Ida Naudain, memorial no. 129865960, viewed on 6 Aug 2016 (naming Rachel S. McCall Naudain as her mother). [S961] Find A Grave, online, above, memorial for Rachel S. McCall Naudain, memorial no. 129865973, viewed on 6 Aug 2016 (naming Rachel S. McCall Naudain as her mother). [S1] Ruth Bennett, Naudain Family of Delaware, above, p. 88. [S961] Find A Grave, online, above, memorial for Mary Ida Naudain, memorial no. 129865960, viewed on 6 Aug 2016. [S961] Find A Grave, online, above, memorial for Mary Ida Naudain, memorial no. 129865960, viewed on 6 Aug 2016 (not giving the date). [S1337] The Evening Journal, Wilmington, Del., online at http://www.newspapers.com, 1 Aug 1893, p. 2, col. 4. [S1] Ruth Bennett, Naudain Family of Delaware (Geneva, Neb. : n.pub., 1941), pp. 87-88 (naming John Wesley Naudain as his father), 99 (naming John W. Naudain as his father). This material is a typescript of "notes" in Ms. Bennett's possession and apparently was originally written and compiled by James W. Lattomus. Copies are with the D.A.R. Library, Washington, D.C., and Roger Bartlett, Austin, Tex., and can be viewed at http://www.rabgenealogy.com/ui53.htm. The notes contain some inconsistencies, and page 45 was missing from the D.A.R. Library copy when it was copied. [S1] Ruth Bennett, Naudain Family of Delaware, above, pp. 87-88 (naming Rachel Sabra McCall as his mother). [S1] Ruth Bennett, Naudain Family of Delaware, above, pp. 88 (giving the date but not the place), 99 (giving the date and place). [S1365] The Sun, Baltimore, Md., online at http://www.newspapers.com, 8 Jun 1935, p. 19, col. 4 (obituary of Mary Elizabeth Naudain) (naming John E. Naudain as her husband but not giving other information). [S1] Ruth Bennett, Naudain Family of Delaware, above, p. 99 (naming John Elias Naudain as his father). Other Names*: Mary Chambers, Mary Elizabeth Chambers Naudain, Mary Elizabeth Naudain, Mary Chambers Naudain, Mary Naudain. [S1] Ruth Bennett, Naudain Family of Delaware (Geneva, Neb. : n.pub., 1941), p. 99. This material is a typescript of "notes" in Ms. Bennett's possession and apparently was originally written and compiled by James W. Lattomus. Copies are with the D.A.R. Library, Washington, D.C., and Roger Bartlett, Austin, Tex., and can be viewed at http://www.rabgenealogy.com/ui53.htm. The notes contain some inconsistencies, and page 45 was missing from the D.A.R. Library copy when it was copied. [S1365] The Sun, Baltimore, Md., above, 8 Jun 1935, p. 19, col. 4 (obituary of Mary Elizabeth Naudain). [S1] Ruth Bennett, Naudain Family of Delaware, above, p. 99 (naming Mary Elizabeth Chambers as his mother). [S1] Ruth Bennett, Naudain Family of Delaware (Geneva, Neb. : n.pub., 1941), pp. 87-88 (naming John Wesley Naudain as his father), 100 (naming John W. Naudain as his father). This material is a typescript of "notes" in Ms. Bennett's possession and apparently was originally written and compiled by James W. Lattomus. Copies are with the D.A.R. Library, Washington, D.C., and Roger Bartlett, Austin, Tex., and can be viewed at http://www.rabgenealogy.com/ui53.htm. The notes contain some inconsistencies, and page 45 was missing from the D.A.R. Library copy when it was copied. [S1] Ruth Bennett, Naudain Family of Delaware, above, pp. 88 (giving the date but not the place), 100 (giving the date and place). [S1] Ruth Bennett, Naudain Family of Delaware, above, pp. 88, 100 (giving the date but not the place). [S1458] Chester Times, Chester, Penn., online at http://www.newspapers.com, 5 Sep 1950, p. 2, col. 7 (obituary for Archibald H. Naudain) (not giving the date or place). [S1461] Pennsylvania Marriages, online at https://www.familysearch.org, viewed on 19 Jul 2018 (giving his name as A. H. Naudain). [S1458] Chester Times, Chester, Penn., above, 5 Sep 1950, p. 2, col. 7 (obituary for Archibald H. Naudain). [S1] Ruth Bennett, Naudain Family of Delaware, above, p. 100 (naming Archibald Henry Naudain as her father). [S1] Ruth Bennett, Naudain Family of Delaware, above, p. 100 (naming Archibald Henry Naudain as his father). Other Names*: Sarah Marker Naudain, Sarah Naudain. [S1] Ruth Bennett, Naudain Family of Delaware (Geneva, Neb. : n.pub., 1941), pp. 88, 100 (giving the date but not the place). This material is a typescript of "notes" in Ms. Bennett's possession and apparently was originally written and compiled by James W. Lattomus. Copies are with the D.A.R. Library, Washington, D.C., and Roger Bartlett, Austin, Tex., and can be viewed at http://www.rabgenealogy.com/ui53.htm. The notes contain some inconsistencies, and page 45 was missing from the D.A.R. Library copy when it was copied. [S1] Ruth Bennett, Naudain Family of Delaware, above, p. 100 (naming Sarah S. Marker as her mother). [S1] Ruth Bennett, Naudain Family of Delaware, above, p. 100 (naming Sarah S. Marker as his mother).